<Version 1.0.2> 2012.07.24 - Fixed a bug where the reset_quest, delete_quest, and setup_quest methods of Game_Interpreter would not work. <Version 1.0.1> 2012.06.08 - Fixed a bug that would occur if there were less than two quest categories. <Version 1.0d> 2012.02.27 - Fixed a bug with distribute_quest_rewards. <Version 1.0c> 2012.02.23 - Fixed a bug where objective_revealed? did not exist. Keep in mind that there are dozens of ways you can rearrange that. I did not give that quest a banner, but aside from that, you can totally rearrange the order in which the data is shown (on a quest per quest basis, if necessary), you can add new categories, you can change the icons of the default categories, you can add new types of data to show, you can change the font used for any particular entry, you can remove the category label window, etc. You have a lot of control over how the script looks, so even if you don't like the look of the default setup shown above, give the script a try and see if you can change it to your satisfaction. Paste this script into its own slot in the Script Editor, above Main but below Materials. You may wish to separate the configuration part of the script from the rest of it, for easier updating. See the header of the script on where the spot to do that is. Please see the Header of the Script for detailed instructions on configuration and use. The script is too long. Please get it from Pastebin. A demo will be released shortly. Debug Addon - napoleon has written a script that creates a debug menu for the Quest Journal, allowing you to manually complete or fail objectives in game to assist in testing. Remove Quests from Default Categories - Some people use the script to display both quests and other information, and they would like the other information not to show up in the all, active, complete, and failed categories. This addon is for them. Please post in this topic at RMRK.net to report any bugs, ask any questions, or make any comments or suggestions. Given the size of this script, I know that I have likely made errors and oversights. I greatly appreciate when someone reports errors. None currently. If you are using a custom menu script, however, it is recommended that the Quest Journal be below it in the Script Editor. Brady has been kind enough to make a nice demo for working with the Quest Journal. I will also be releasing a demo some time. This script imports most of the features from the VX version 2.1, as well as adds quite a few more. One of the features that has not been imported is the Quest Shop. I will likely write an addon to the script for that feature sometime in the future, but for now I figured I would just release the basic script. Looks great, I'm glad you decided to export it to VXA. I have a blog now where I will be posting my scripts that I create. Because, even if you don't want quest journal, you can create with this script whatever you want. Wise using really grants ton of capabilities! With QuestJournal for old VX I created Achievments scene, with Ace version it's much easier, and (thanks to categories!) can be combined with other cool things (like Quest+Notes+Achievments Scene). This scripts makes me very happy! I like huge descriptions. And ranks (star icons super, and F-E-D-C-B-A-S for ninja games!). Omg, Global Text Codes works, I get colored quest name right now. It's remind me about ATS, both scripts have great customization (there was Synthesys Shop example in ATS VX 3.0 demo, and I created Teleportation System with Advanced Choises). THIS IS AWESOME YOU ARE AMAZING. Well, I am glad you all like it and I hope that it doesn't disappoint! And I am glad that you like the customization AlexArmstrong, It's always hard to choose a balance between ease of use and customizability, and I don't think I ever strike it right. So it's nice to know when people put it to good use The travel journal looks good too. P.S. You don't need to put the "Major Name:" (Mayor?) inside the quest data itself: you can change it in the VOCAB hash itself. client and location are around line 355, and you can just change it from "" to "Major Name:"
Yes, I really like it. It's not simple easy script, but it have good instructions. After 1.5 hours I easily created travel guide first version in about 15 min (banner was the hardest thing xD). And yes, it was just quick test version, so i doesn't put much work in it (actually, even "name" word not neccessary, it's ok just with icon and text like "Mayor Daniel" or "King Arthur", "Elder Ralph" etc.). Well, waiting your other new scripts! (type of interesting in crafting system too). Best regards! I created new category :guide and add q[:custom_categories] = [:guide] in my quest. I'm not sure, maybe I'm just missed something in categories, but I have no idea, what it is. Nah, that's my bad. Grab Version 1.0a from the first post. You don't need to replace the configuration, just the rest. Script 'Window Selectable' line 212 NoMethodError occurred. You've done it again... Love it! So glad such talented people are part of the RM community. The last script I need. Big thanks once again. I can't use "objective_revealed? (a, b)" on a condition branch. It gives a No Method Error on Game_Interpreter. Apart from that, it's an amazing script! Once you are done with your extended choices, I'll have everything I need for my project's systems! Sorry, I will post the fixed version shortly. I used the script call quest(1).description = "" to change the description and this is how it turned out. d = "Jessica has told me that Boris is "
d += "looking for me. Maybe I should talk "
d += "to him before I do anything else." Is there a way to make the "objectives" to have a different VOCAB on different custom layouts? 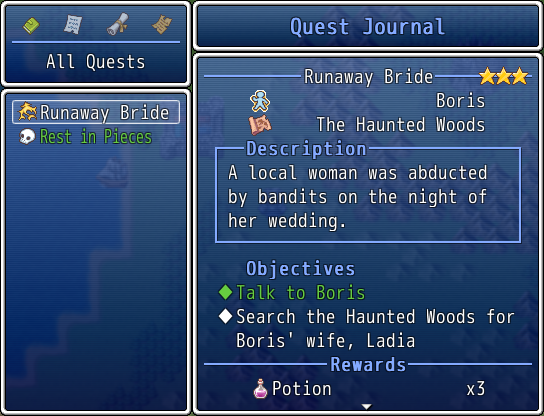 For example: I have quests that use the default layout and the "objectives" VOCAB is set to "Summary". On another (custom) layout, I'd also like to use the "objectives", but this time with the VOCAB "Notes". I think I could create a new BASIC_DATA_TYPE and set its VOCAB to "Notes", but then it wouldn't answer to the functions I can use with objectives, like "reveal_objective(x, y)". I don't think that's a feature I care to add to the main script, but maybe I will write a little work around that would permit you to do it. I understand. Thanks for that. Thanks for the hard work. However, I got a problem. I do always get this Error (pic below), after the complete_objective function. I added a picture. The script I wrote are: "quest(1)", "reveal_objective(1, 1)" and "complete_objective (1, 1)", where it crashes. As I'm the only one experiencing the problem I think it's my fault, but I don't know where. I used the sample quest for testing. Page created in 1.021 seconds with 25 queries.